Like most red-blooded Americans, I love barbecue. Vegetarianism is admirable and almost certainly better for you, but some of the foods that make it seem like an impossibility for me include steak, burgers, and barbecue. I am no barbecue expert, and I recognize that in fact there is such a thing as that. In fact my college classmate Caryn now actually judges barbecue contests, and had to get certified to do so, so it is treated with the same religiosity in the South as many food concerns are in Italy. At any rate, New York is a Mecca for foodies, and understandably so. But there is an overall lack of truly high-quality barbecue in this town. I know, there are those who will swear up and down about Dinosaur BBQ, or Blue Smoke (which I don’t get), and others who will tout (more convincingly, in my book) Hill Country – and we have a few other places that do indeed make barbecue, but is it any good? Mostly, and sadly, the answer is no. It is usually heavily sauced and lousy. Granted, there are a few places I have yet to hit (R.U.B., I’m looking at you, for example) but in the meanwhile I’ve yet to find a convenient and top shelf (flavorwise) barbecue experience. When you're on a sidestreet, you need a bold sign. Now, with all this barbecue discussion, you’d be correct in thinking that it is a barbecue joint. But it is frankly more than that, it is a Southern food, soul food joint, which of course has some barbecue elements on the menu. It was their barbecue offerings that got me interested in them, and I am pleased to report that they are very suitable and winning. But as wonderful as their ribs are, it is their fried chicken that keeps me coming back. The fried chicken is decadent and delicious. Now the shop itself is on the small side. It’s located on a side street, which I imagine must be hard for any business. There’s small bar and seating area up front, a narrow hallway, and then a rectangular seating are in the back. It’s an awkward shape, but they’ve done a nice job of making the place feel cosy. Part of that is a significant on making it seem rustic. The wooden plank walls in the back are painted sickly green, and the faux-rusty tin ceiling also caught my eye. Even though it was the middle of January when I visited, and granted – it was a 50 degree day, which is odd in itself – it was a little dismaying to see the small squad of flies that were working the back dining area. Not too many, mind you, but enough to guarantee a fly-by probe of your food if you’re not careful. Two succulent shrimp lurk below. I started with the gumbo. 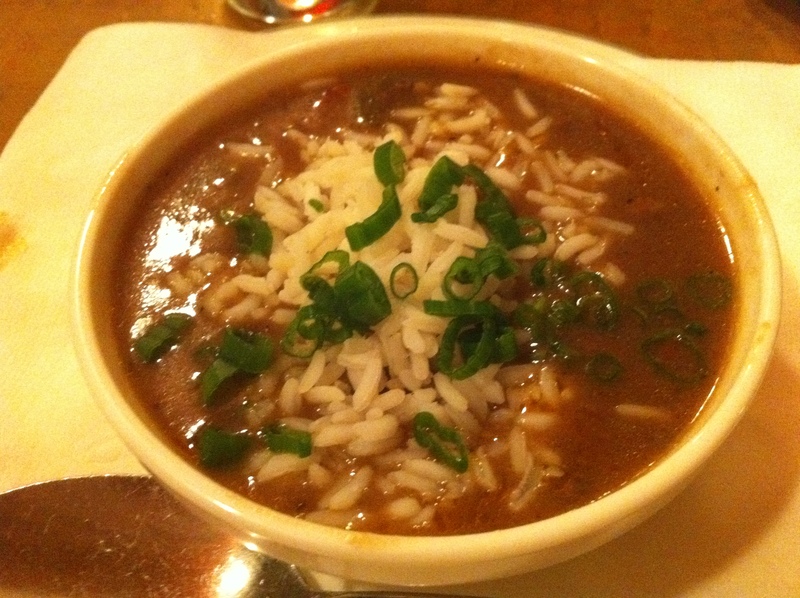 I’m not a gumbo connoisseur either, but I’ll say simply I wasn’t too wild about it. It has a suitable heat and spiciness, and there was a faint thickness to the sauce. There were two nice shrimp in the cup, and I must say the presentation was nice. It is satisfyingly hearty, but to my palette it didn’t quite sing. 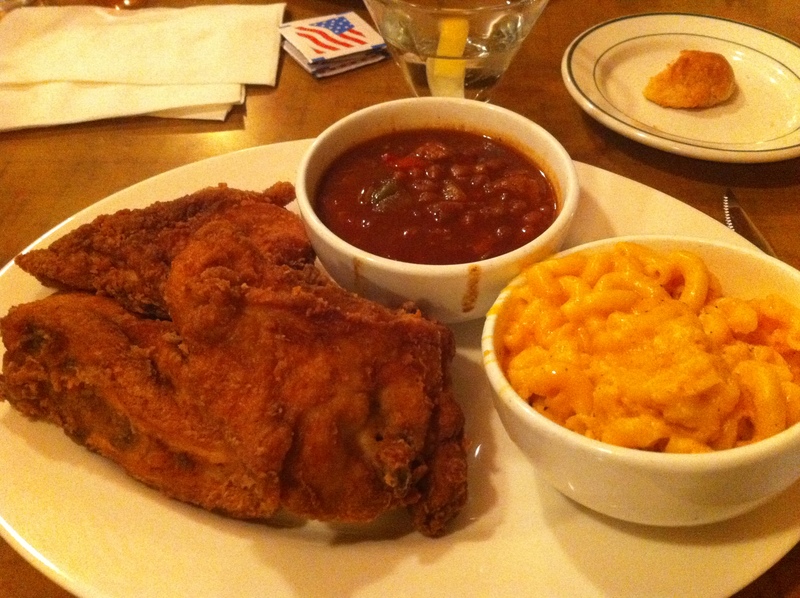 The fried chicken with baked beans and mac and cheese. 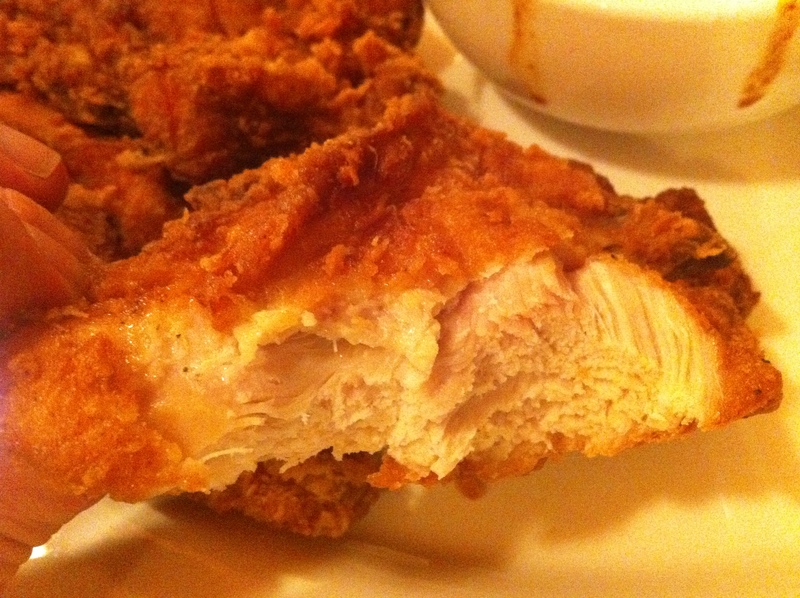 The fried chicken, however, is a panacea and will cure what ails ya. It is just marvelous. Now everyone knows that fried food is generally wonderful, especially when it has a fried coating that looks like the surface of Mars, texture-wise. 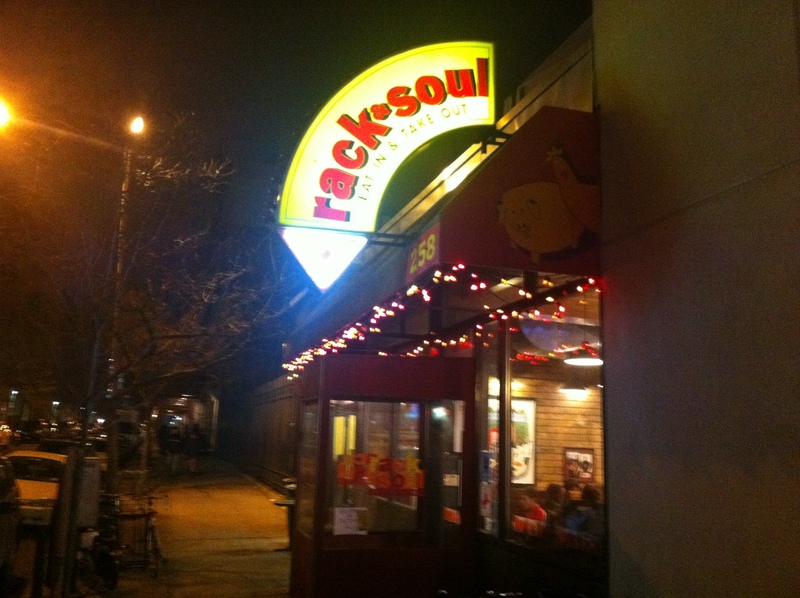 Importantly – crucially – Rack & Soul’s fried chicken is not greasy. That to me is miraculous, as many a fried chicken joint, will deliver you a greasy heart attack special. Here you may have a heart attack, but it seems like it’ll be slightly healthier. 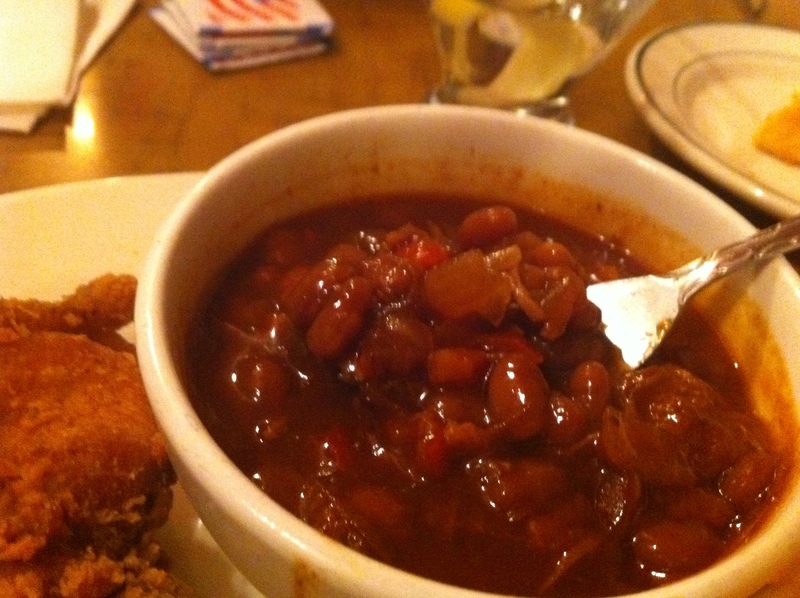 Rack & Soul has a secret weapon: Their baked beans. Holy mackerel, they are fantastic. They’re made with chunks of pork and some pepper and onions. They routinely steal the show of whatever meal I get there, be it chicken or ribs. I always get the mac, but it's not as good as it should be. I can’t really say much, lamentably, about the mac and cheese. I love mac and cheese. Theirs seems more like a texture than anything else. 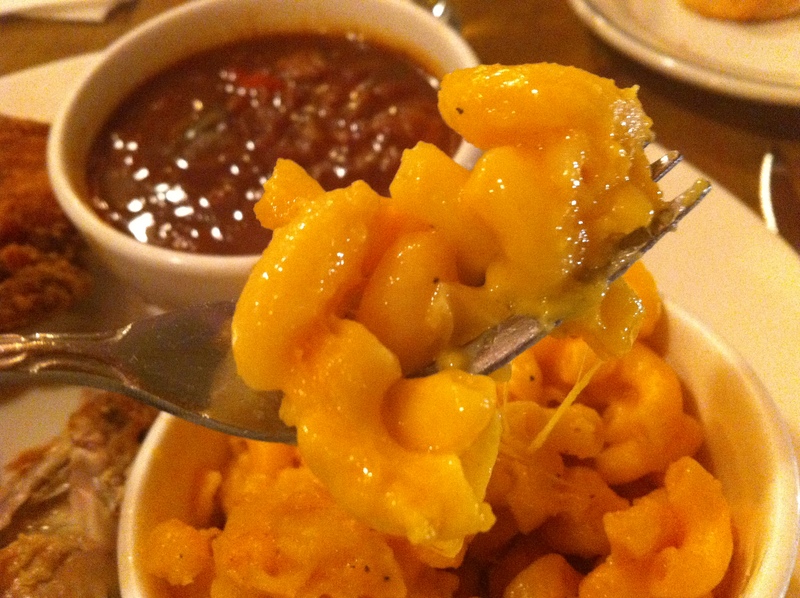 It is good and buttery, but it is nowhere near the excellent mac and cheese available at Delta Grill, for example. That combo is ridiculous. Also: $3.50 Budweiser's! 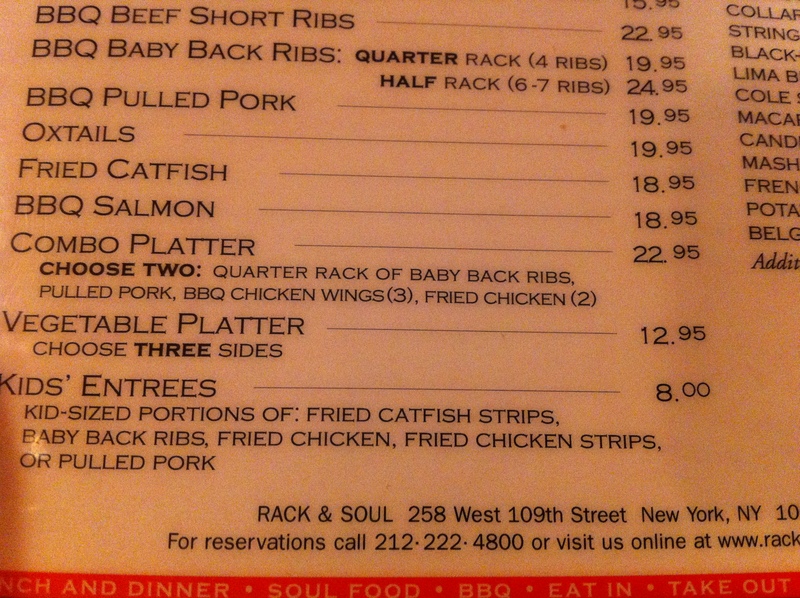 I should also discuss the pricing at Rack & Soul. Entrees hover around $19-20 per. Yet they have a special combo deal, for $22, which is way too much food for most mortals. As part of the combo, you get two (smaller) entrees. Also, they serve a “kids portion” for $8, which comes with two sides. That’s also an ample portion. So whether you want to eat heavy, heavier or really heavy, it’s all there for you. We had the fried chicken, a kids portion of catfish, and two drinks and got out of there stuffed for about $60 before tip. And yes, they deliver. All in all, it is easy to recommend Rack & Soul. Delicious ribs, sensational chicken: It is high quality decadence. When you want a blast of Southern comfort food, come here. ← Why Do People Go Rushing Headlong To Shake Shack When Eisenberg’s Sandwich Shop Is Right Across The Street?